Maria Guajardo, one of three candidates to be president of Fort Lewis College, answers questions Thursday afternoon in the Student Union Ballroom. Maria Guajardo, one of three candidates seeking to become the next president of Fort Lewis College, hugged Katherine Montoya, a senior sociology major, when asked what attracted her to a school suffering from enrollment declines and projected budget shortfalls. Guajardo acknowledged difficult decisions will have to be made at FLC. She said open and honest communication would be key to addressing any cuts that are made stemming from a budget crunch caused by declining enrollment. “We will need to have courageous communications on difficult topics. There will be points where you will disagree. 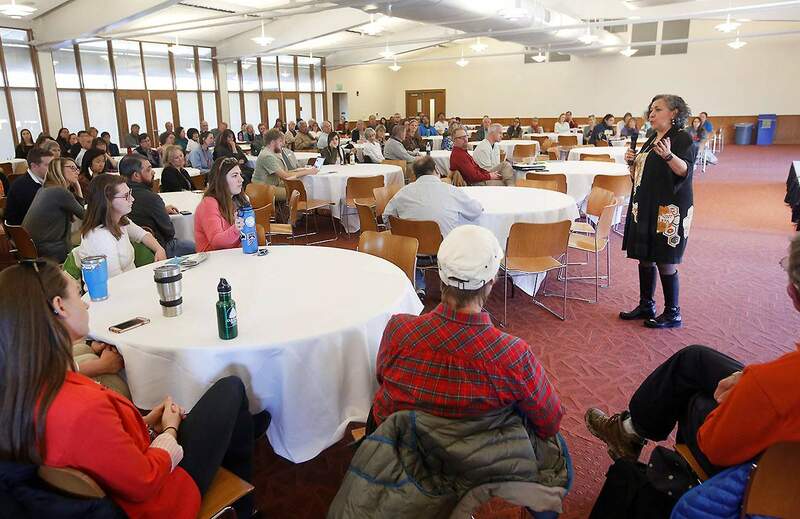 There will be points where I will disagree, but the communication has to be built on trust and respect,” Guajardo told a crowd of about 100 Thursday at the Student Ballroom at Fort Lewis College during an open forum. Guajardo, who is a psychologist, said she also thinks about what comes after budget cuts are made. “How do we heal from these times when we’ve been hurt?” she asked. “How do we forgive? Or do we not let go? How do we grow and move forward,” she told the crowd. Guajardo said open channels of communication are needed so those who don’t agree with final decisions at least feel they participated and were involved in the decision-making process. Guajardo currently serves as deputy vice president at Soka University in Tokyo, where she developed a new degree program in international liberal arts. She is the first Latina to serve on the Soka University of America Board of Trustees. She received a bachelor’s degree in psychology from Harvard University and master’s and doctorate degrees in clinical psychology from the University of Denver. 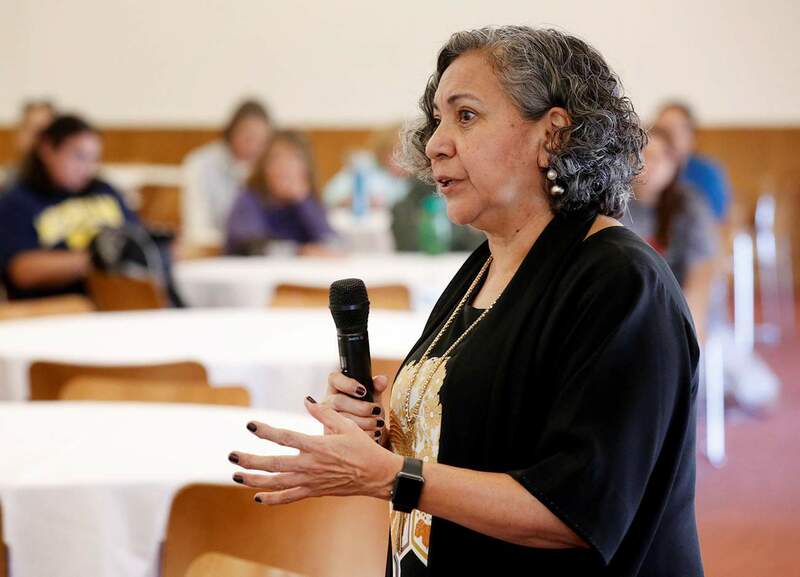 Her doctoral dissertation examined the question of Latinas dropping out of school, which launched her career at the Colorado Department of Education, where she served as the state’s dropout prevention coordinator. She also has served as the executive director of the Latin American Research and Service Agency in Denver and executive director of Assets for Colorado Youth. Then Denver Mayor John Hickenlooper selected Guajardo as the executive director of the Mayor’s Office for Education and Children. She grew up in Central California, the daughter of illiterate migrant farmworkers. Another open forum for Guajardo will be held from 9:30 to 11 a.m. Friday in Room 130 of Noble Hall on the FLC campus. Maria Guajardo, one of three candidates to be president of Fort Lewis College, says serving as an administrator for a university in Japan has given her familiarity with schools struggling with enrollment challenges. Serving as an administrator for a university in Japan, she said, has given her familiarity with schools struggling with enrollment challenges. It is estimated that 20 percent of the nation’s universities will have to close by 2020, a result of declining population. “Everyone is scrambling for 18-year-olds,” she said. Soka University has been able to sustain its enrollment and even increase enrollment by attracting foreign students, Guajardo said. Increasing the number of foreign students has given her an appreciation for creating welcoming communities for people of different cultures that help support them emotionally and academically and help them graduate, she said. Teresa C. Balser, dean of teaching and learning for the School of Engineering at Curtin University in Perth, Australia. Balser will visit Fort Lewis College and Durango Wednesday and Thursday, April 4-5.Tom Stritikus, deputy director of K-12 U.S. Programs for the Bill & Melinda Gates Foundation in Seattle. Stritikus will visit Monday and Tuesday, April 2-3.The Board of Trustees is scheduled to meet April 13, when comments will be taken about the three finalists to replace Dene Thomas, the current president, who will retire at the end of the academic year. Steve Short, chairman of the Board of Trustees, said he expects trustees to go into executive session after the April 13 meeting to discuss the three finalists. He said he expects a special Board of Trustees meeting will be set about a week after the April 13 meeting to announce the next president.